When I was pregnant with my son 22 years ago I started having issues with low blood sugar. Considering all this baby wanted to eat was Dove Ice Cream Bars its no wonder! Up until that time I could eat anything I wanted with no ill effect. Pregnancy changed me forever in many ways. My feet got bigger and stayed that way. My belly looks like I’ve had a baby and my hips are no longer the boy hips I once had before I had a 10 lb baby. The low blood sugar started me on a path of study to find the perfect “diet” to balance my blood sugars and my hormones. Over the next 20 years I would become vegetarian, vegan and even a raw foodist. Later, I realized I felt better if I ate meat so I tried the Adkins diet. When that didn’t work I moved on to low-fat, gluten-free and then paleo. And that’s not even the whole list. What I’ve learned from all of this experimentation is that there is not one diet for every body. And if we use our intuition our body will tell us how to feed it properly. I am continually asking my body what it needs to experience optimal health so I am consistently fine tuning what I eat. Today I am eat mostly low carb, gluten free with moderate protein. I am feeling more and more healthy the older I get and I’ll be 50 this year. I do treat myself to a naughty day once in a while and that helps me be more honoring of my body’s wisdom the rest of the time. 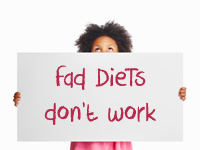 Exploring what diet works and what doesn’t has been a valuable resource. I have learned a lot about nutrition over the years and have become a better cook as a result. I invite you to research any diet you feel “guided” to explore. I also recommend two books about learning to be present and thus intuitive while eating. The Slow Down Diet by Marc David and Savor by Thich Nhat Hanh. May all your future meals be deliciously savored and enjoyed! Find out more about Della here.